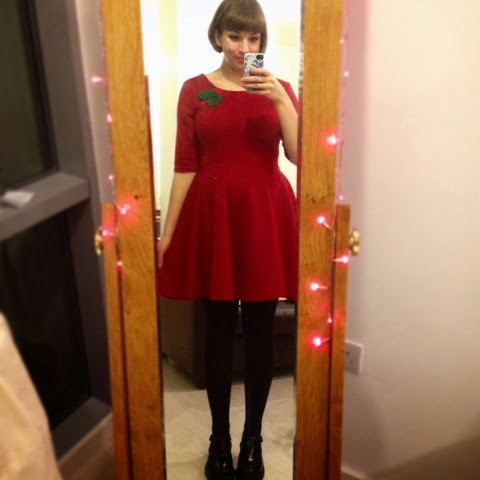 I've been so absorbed in the self-drafted sewing that it feels like I haven't finished anything in forever! So having come to the end of my 10 week pattern drafting course, my pattern is just about ready to make, well, at least in wearable muslin form before I commit to cutting into the good stuff - some glorious teal green crepe I picked up from the new Sew Over It shop in Islington. I thought it would be nice to have a bit of a breather before I launch into the final thing, so mull all the wine and get the tinsel out - I whizzed up a dress for December! 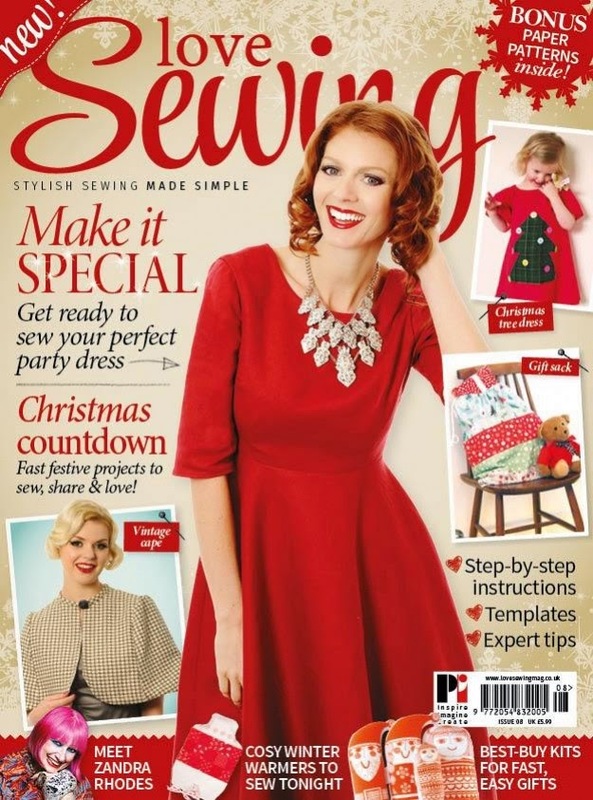 I used the Simple Sew skater dress pattern that came free with issue 8 of Love Sewing magazine (my mum picks me up a copy if she likes the free pattern ha, thanks mum!) I really liked the Lottie blouse pattern that came free with a past issue and made a few versions of it. , They are, by definition, simple patterns, so I thought I'd give it a go. I bought a medium-weight (Santa) red viscose jersey from my favourite B&M Fabrics in Leeds Kirkgate Market. 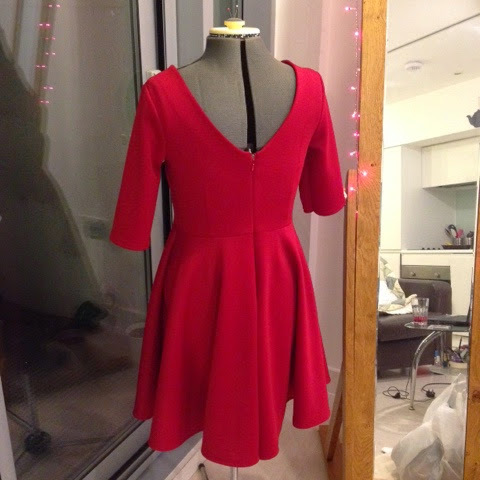 I've worked in lightweight fabrics with a tiny bit of stretch before, but this was my first big leap into the world of proper stretch fabric, and I loved it! It took me a bit of faffing with my sewing machine manual and some needle changes, but it was otherwise completely pain free. Plus the fabric is so easy to work with - the seams barely needed finishing *cough* lazy sewist *cough*. Now I don't know if it's just me, but my completed dress isn't quite what I was expecting from the magazine cover image and the illustration on the pattern. I realised pretty early on - but too late to do anything about it - that the dress might be a bit on the short side of knee length, but oh, it's short. I also found that the pattern could do with a bit more length in the bodice too - at least for me. I ended up using a smaller seam allowance at the waist and doing the narrowest hem possible, just to lengthen it in any way I could. So I was a bit disappointed as I was really looking forward to a voluminous, flowing, knee-length, jersey skirt. 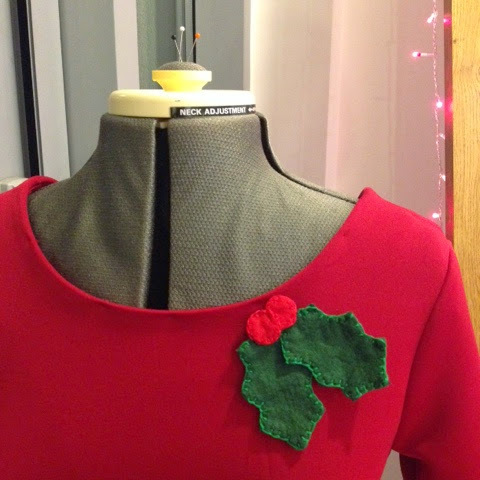 The felt blanket-stitched holly brooch was actually my dramatic last ditch attempt to 'salvage' what I had originally branded a 'festive fail' ha. Anyway, I wore the dress in the house and swished the skirt around for a little while and came round to it in the end. Despite a few gripes here, there are actually things I really like about this dress and I'll probably make it again with a few adjustments. I love the V-back! I've never considered ermm getting my back out, but it sort of works! It has offers plenty of room to get creative - pockets, trims, a fancy lining maybe? Add at least 1 inch to the bodice and taper the pattern down from a size 12 to a 10 at the waist. Add a good 4 inches (maybe more!) to the hem - I'm such a prude! Finish the neckline better. My mind was in simple sew mode and I completely forgot to interface my facings, massive oops! 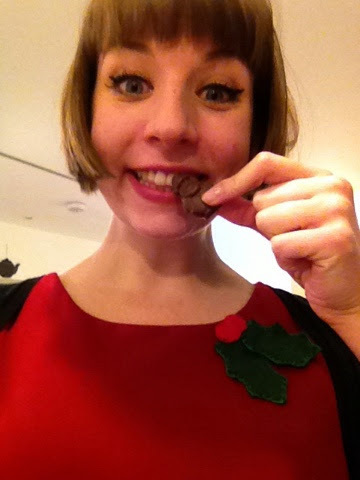 Here's a selfie of me, full of Christmas joy and ready to eat my advent calendar Santa. Is #SeasonalSew already a hashtag or sewist initiative? If it is, then GREAT. If not... then lets get the ball rolling, it's nearly Christmas! 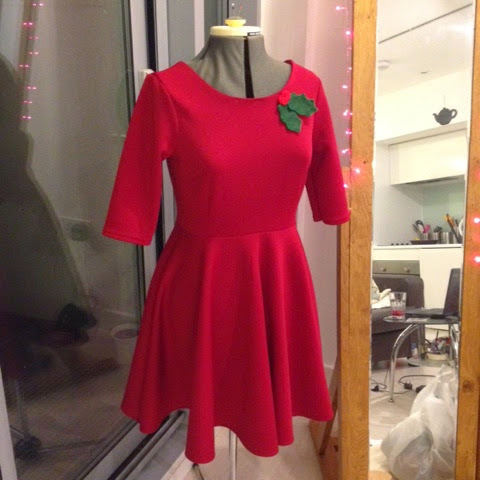 I'm hoping to use the next couple of weeks to make my self-drafted dress and catch up on a bit of knitting in between the Christmas shopping and parties - hopefully a bit of blogging in there somewhere too. I think it looks really nice! Could you find some stretch Jersey in a contrast colour to make it longer? Might be worth a try! You're right the pattern image is misleading. I think it looks great on though and it's not like you would wear it without tights at Christmas any way so I reckon wear it as it is. I love the v back too. Gorgeous. I think your dress is lovely! I agree with littlerosemakes about adding length to the hem. 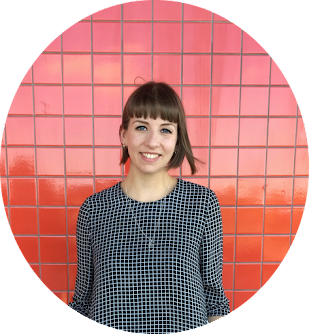 If you have some fabric left over, it could be added to the hem, and called a design feature! Thank you Lynne - I love a good design feature ha. Might have to give it a try after a wear or two! Such a shame it turned out shorter than you wanted but otherwise it's a lovely shape. Adding a border is always an option or you could hack it shorter into a peplum top. Or you could just rock it as it is in a glorious pair of jazzy tights! I had real trouble with this pattern. Some of the pictures and instructions were wrong, and the pattern seemed incomplete. There was no instruction of how to sew up the front skirt to the back skirt. Plus the shape of the bodice and the shape of the skirt top were different, and again there was no instruction of how to attach them together. The pattern said "adventurous beginner" but I think that's an exaggeration. If you haven't already done so, then pin the back skirt pieces to each side of the front skirt (right sides together) sew, using the same seam allowance you've been using and press. I'd position the bodice and the top of the skirt together, pinning them together at the centre fronts to get an idea of what it looks like. If the skirt is bigger, then you can work out how much you need to take it in by - I'd do this at the side seams. This would be exactly the same if the bodice is bigger. 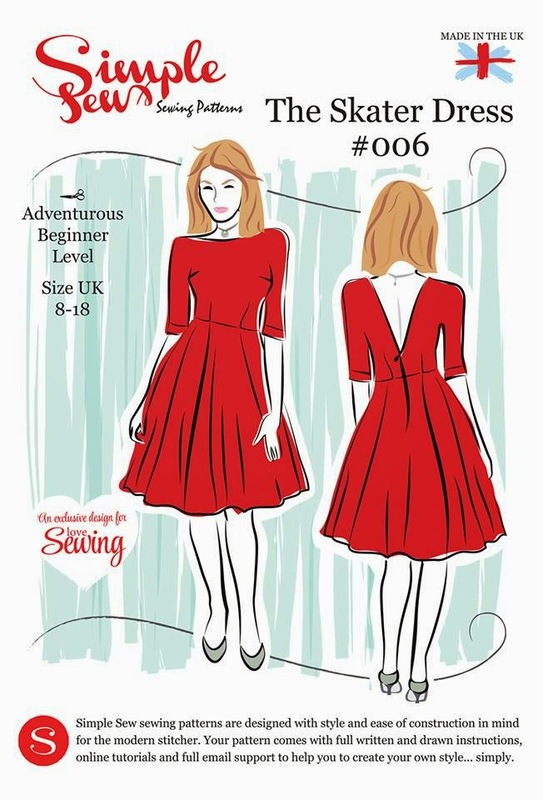 Once you've got them the same size, then you'll need to pin the skirt and bodice right sides together - matching the centre fronts, the side seams and the centre back - and sew them together.